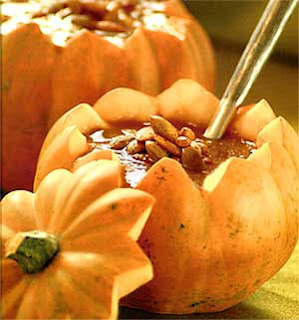 I love eating soup when the weather turns cold and can't wait to try serving my next batch in a pumpkin soup tureen. I'm going to try the directions found here except I probably won't bake the pumpkin quite as long. I think the kids will get a kick out of helping me clean and bake an entire pumpkin but I'm sure our favorite part will be enjoying the presentation. It's not everyday you get to eat soup out of a pumpkin.